WELLESLEY, Mass. -- A lawyer for one of two college students barred from their campus for taunting students at Hillary Clinton’s alma mater in Massachusetts is demanding an apology after the ban was removed. Social media reports indicated the students shouted racial and homophobic slurs near the Harambee House, the center for African-American students. But Jeffrey Robbins, Rand-Ricciardi’s attorney, told The Boston Globe that the Babson College investigation could not back up those allegations or prove they had purposely stopped at the Harambee House. Robbins is threatening a defamation suit against the school. The Boston Herald reported that Babson told the students Sunday the ban had been lifted. 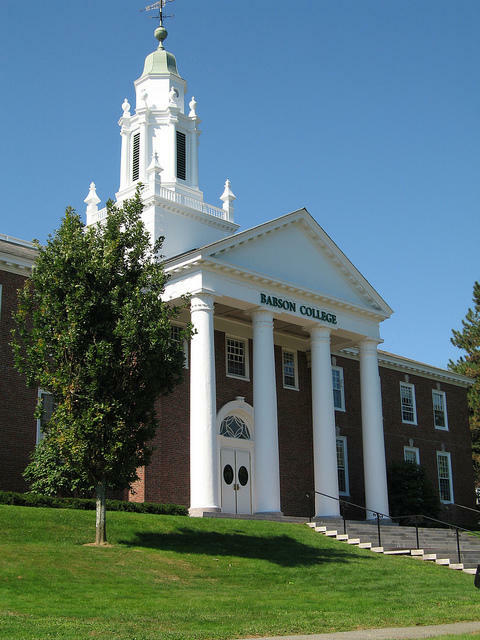 Robbins is calling on Babson to retract its statements questioning the duo. Robbins also wants an apology and internal harassment and disorderly conduct charges withdrawn. Attorneys for Rand-Ricciardi and Tomasso declined to comment. Babson said it doesn’t comment on specific student conduct matters.